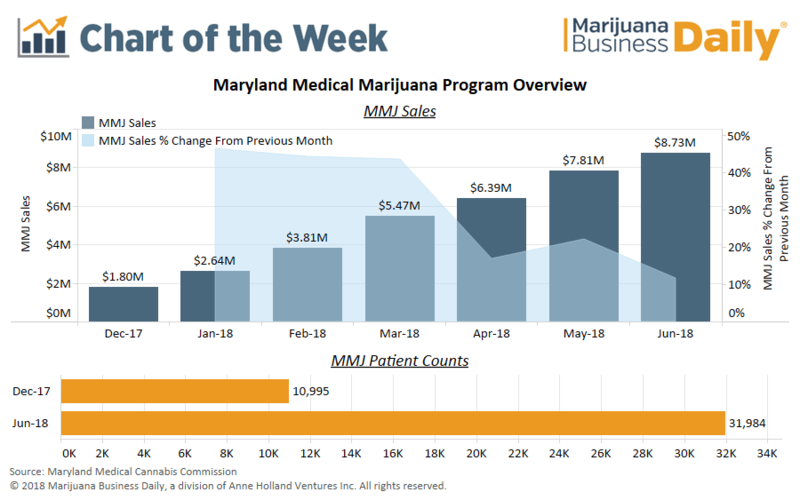 Maryland’s medical marijuana market is off to a hot start – a welcome development for a program that took more than four years to get off the ground. Dispensaries racked up nearly $35 million in sales in the first six months of 2018, and market activity is expected to increase significantly as more stores open their doors and patients register for the program. Sales could approach the $100 million mark by the end of the year. As of June 2018, roughly 32,000 patients had been granted MMJ cards, an increase of 191% from December 2017. Nearly 13,000 additional patient applications are pending. The state gives doctors a relatively high degree of flexibility when deciding to recommend medical marijuana to patients. Maryland has a list of qualifying conditions – like most other states with MMJ programs – but also allows recommendations in cases where a condition that’s not on the list is severe, unresponsive to other medical treatments and shows symptoms that can “reasonably be expected to be relieved” through cannabis. Access to MMJ in the state is high. Currently, 57 dispensaries are licensed throughout Maryland – more stores per square mile than any other state with a medical cannabis program. Regulators expect to eventually grant 102 dispensary licenses. Maryland allows the sale of flower, a boost for the industry because it is the most popular form of MMJ. States with existing programs that prohibit the sale of flower – such as New York and Minnesota – have struggled with low patient counts and lackluster sales. Many states that have yet to come online will restrict access to or ban smokable forms altogether – such as Louisiana, Ohio, North Dakota and West Virginia – which is expected to dampen sales prospects. Good for Maryland. We need this in North Carolina.